Happy Saturday, book lovers! Today, I'm doing an alternative kind of review about Prestige Flowers (pictured above). Since I adore flowers and everything Pretty, it was a welcome invitation to review! About Prestige Flowers Flower delivery by Prestige Flowers, Voted #1 on Review Center and Review Florist's Editor's Choice 2014. We have an incredible selection of vibrant and elegant bouquets. We deliver 7 days a week and next day delivery is possible when you order flowers before 9pm with our flowers by post.Each bouquet is designed by our head florist with over 25 years of experience and use only the freshest and most premium quality stems in our arrangements so you can enjoy them for longer. Flowers with free delivery available on select arrangements.We pride ourselves with an enviable reputation for quality flowers online with over a million bouquets delivered to date. If you are having trouble deciding on a bouquet our florist team are here to help. All of our bouquets are backed by our 100% Satisfaction Guarantee so you can safely order flowers. With an excellent review rating of 4.7/5 we are proud to be the UK's favourite online florist. Flowers are one of those things that just makes a room. They're the focal point of fields, coffee tables and windowsills. Even with hayfever, I still can't stay away from their beauty and wanting them in my house. When I had the chance to work with Prestige Flowers on their Valentine Flowers I was thrilled. They arrived in a beautifully patterned box (pictured above) and inside were the most gorgeous Red Roses that I had ever seen. They were delicate and strikingly magnificent. 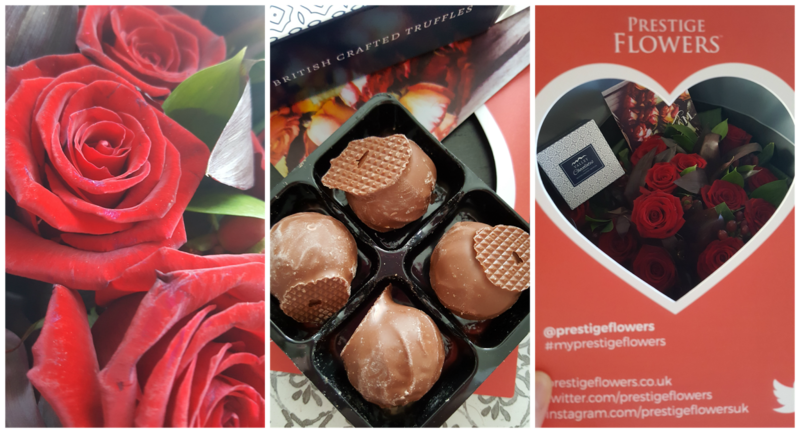 Along with the Roses, there were a box of British Crafted Truffles (included in most flower deliveries) and they were SO GOOD. The kind that you don't want to share. I received these last Saturday and I wanted to give them a chance to bloom and thrive before I fully reviewed them and gave my final thoughts, and all I can say is that no other flowers that I've bought before have lasted this long and still look beautiful. Since Valentine's Day is almost upon us, these Roses reminded me of all things love. They're reasonably priced for flowers (actually cheaper than most I've seen on flower delivery sites) and they do a range of Roses, Lilies, Orchids, you name it. Overall, they're perfect for all occasions, especially Valentine's Day. 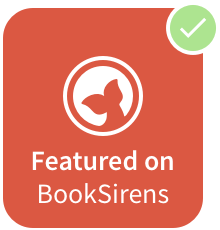 Their service is easy to use and they have an in-depth review of all the flowers, occasions and types of hampers you can get online. 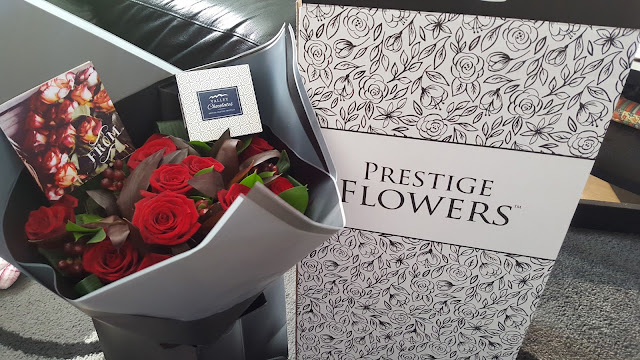 If you're looking for a place to get your significant other flowers for Valentine's, without a doubt Prestige Flowers would be top of my recommendation list. Truly beautiful! *This post was sponsored by Prestige Flowers for an honest review of their Valentine's Roses. I was not paid for this review and was only gifted the above items. Happy Saturday! I hope you all have the best weekend.